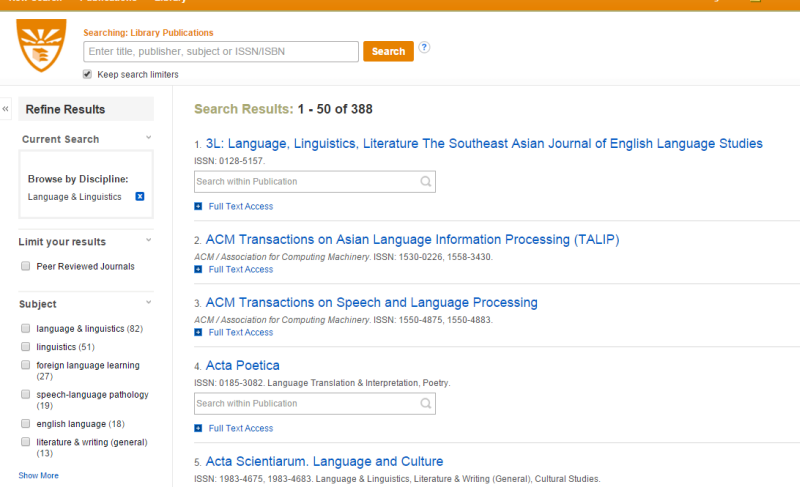 Journal Finder helps you locate and access journal articles in the Online Library. It is also sometimes called Full-text Journal Finder or FReD. You can find out whether the Online Library has access to a specific journal. 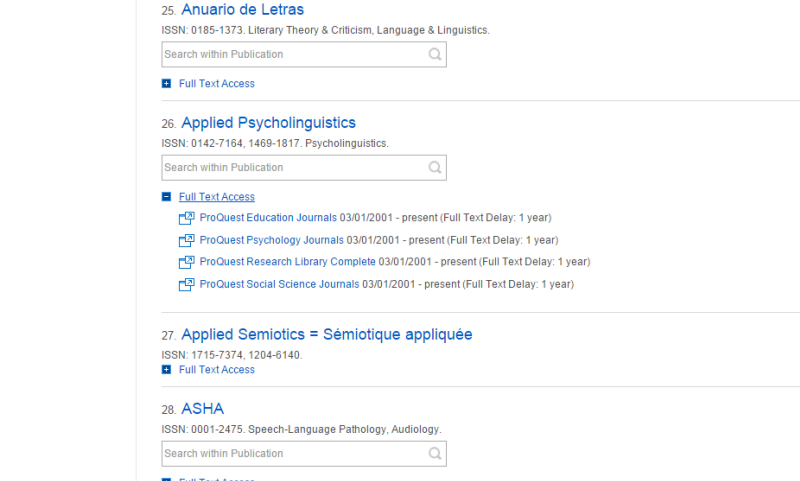 You can browse a list of available journals, either by subject or by title. Learn how to access the college's research databases and how to enter your college login at How To Access Library Databases. Go to the Online Library at www.esc.edu/library. Click Journal Finder in the first column. 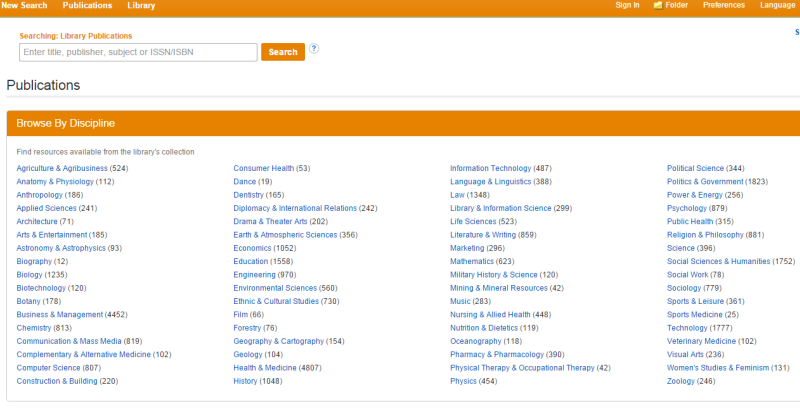 In the top left menu, select either New Search to search by title, or Publications to browse by subject area. Click New Search in that top left menu. Use the drop-down menu next to the search box to select Title. Type in the journal's title, or the first few words of the title. It will try to autocomplete what you type with the titles of journals that we have in our collection. Click Publications in that top left menu. You will have a search box at the top of the page, and beneath it is a section called Browse By Discipline. This is an alphabetical list of subject areas. Next to each subject area, in parentheses, is the number of full-text online journals we have in that subject area. Click the one you want and you will be taken to a search results list of journals in that subject area, with options to narrow down your results on the left side of the list. When you use New Search to look up a journal title, or Publications to look up journals in a subject area, you will get a results list. The journals in the results list are listed alphabetically. Underneath each journal is a link to find Full Text Access to that publication. Underneath some of the journals is a search box. This allows you to look up an article title within the journal, or look up articles containing certain keywords within the journal. On the left side is the Refine Results menu column. You can click the checkbox to limit the results list to just Peer Reviewed Journals. You can click the checkbox for a particular Subject, which means a subset of the subject you are already searching. For example, here we are in Language & Literature Journals, and there are 338 of them. One way you could narrow it down would be to select Literature & Writing Journals - there are only 13 in that sub-topic. Under the journal that you want, click the Full Text Access link to expand a list of databases that have issues from that journal. There may be more than one database that has this journal. Often issues published before the 1990s are not available online, because they were not "born digital" and have not been digitized yet. Sometimes issues published in the past year or two are not available online, because publishing companies restrict online access to them until they are somewhat out of date. Search within the journal, either for articles by title, articles by author, or for articles containing your keywords. Browse the journal year by year and issue by issue. or check our knowledgebase or submit a question via online form. Please note: If you need to request accommodations with content linked to on this guide, on the basis of a disability, please contact Disability Services by emailing them at Disability.Services@esc.edu. Requests for accommodations should be submitted as early as possible to allow for sufficient planning. If you have questions, please visit the disability services website http://www.esc.edu/disabilityservices.